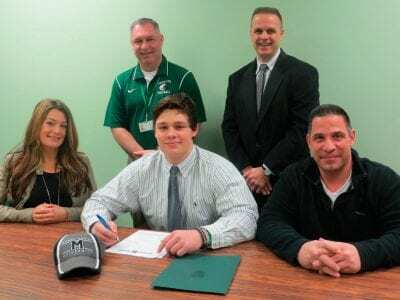 Football Standout Golinello Off to Mercyhurst College in Pa.
KINGSTON – This wasn’t about who could outscore who. This was about who could stop who, and there is a difference. Mahopac High School’s second-half defense was the key on Monday as the Indians went on the road and beat a good King… Please login below or purchase a subscription to the Putnam County Courier to access this content. FREEDOM PLAINS – Not many people are able to figure out the Arlington High School baseball team, defending Section One, Class AA champions and participants in last year’s New York State Final Four. And even when they do, the Admirals hav… Please login below or purchase a subscription to the Putnam County Courier to access this content. Mahopac High School basketball star Mairead Hynes had an outstanding senior season and drew kudos and praise from all corners after taking the Indians on a run to the Section One, Class AA final. Now Hynes is started to reap some benefits. Hynes was… Please login below or purchase a subscription to the Putnam County Courier to access this content. One game into the high school softball season, it’s clear that pitching will carry the Brewster and Carmel programs far this spring. Oh, and the hitting’s not too shabby either. Both teams began their seasons in style as the Bears beat J… Please login below or purchase a subscription to the Putnam County Courier to access this content. THURSDAY, APRIL 10 GIRLS LACROSSE Brewster at Ossining, 4:15 p.m.SOFTBALLYorktown at Brewster, 4:30 p.m.Lakeland at Mahopac, 4:30 p.m.BASEBALLBrewster at Putnam Valley, 4:30 p.m.Mahopac at Yorktown, 4:30 p.m.BOYS LACROSSEEdgemont at Brewster, 4:30 p… Please login below or purchase a subscription to the Putnam County Courier to access this content. Gus and Karen Pourakis prepare the meals with a smile. Fish and chips enthusiasts arrived early and many stayed late as a steady stream of diners packed George’s Restaurant Friday night for fun, fellowship and fresh fried fish all to benefit th… Please login below or purchase a subscription to the Putnam County Courier to access this content. A northern Westchester man accused of stealing two Communion chalices and cash from St. Lawrence O’Toole Church in Brewster last month, in what authorities called a shameless burglary, is behind bars on felony counts of grand larceny. William Skeeth… Please login below or purchase a subscription to the Putnam County Courier to access this content.